The track bike or ‘flip bike’ is very striking. The bike is inspired by legendary cyclist, Fausto Coppi who competed and won the Tour de France with a fixed wheel track bike. The back wheel of the bike can be flipped with one side being a regular single speed with a free wheel in low gear ratio and one being fixed. The was a popular way of running a bike in the early days of competitive cycling and fixed wheel was faster over flat ground, while the single speed with a freewheel was easier to ride when the stage became more hilly. To reflect this ‘flip-ability’ the paint on the frame is split down the middle in two colours, so that from one side it appears to be green for example, and other side navy. The lugs are picked out in a contrasting colour to match the classic Mercian barber pole down the seat tube. The lugs and barbers pole are then hand finished with another complimentary colour. The frames are built in Reynolds 631 tubing and the frame design is also exclusive to Paul Smith, where the spearpoint lugs seen on our Professional frame (used to stiffen the bottom bracket area) have been added to every lug. This will make the bike very stiff and responsive. The spearpoint lugs are not cosmetic and added to the frame following construction - but are hand cut, joined, carefully filed by hand and added to the lug before the tubes are joined, using our traditional open hearth brazing method. 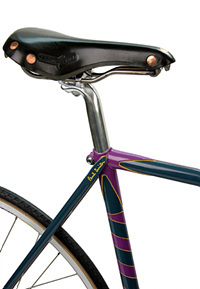 The seat lug area has Paul Smith signature engraved into the top-eye on one side, with Mercian engraved on the other side. 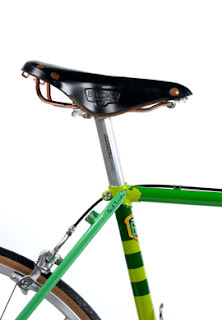 Every small detail on all of the bikes has been specified by Paul Smith, from the exact shade of enamel paint to the colour of the Brooks handlebar tape and saddles. The result is a stunning bike!